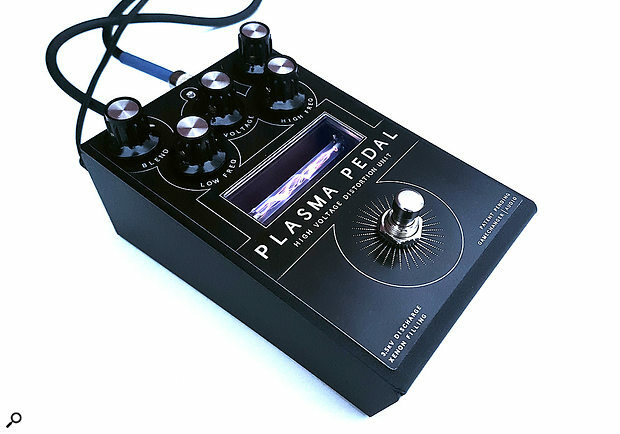 The Plasma Pedal is a very different take on the distortion pedal, and it would be very easy to mistake its description as some kind of April Fool's joke. Essentially, it is a very aggressive-sounding fuzz box — but rather than use the familiar mechanisms of overloaded analogue circuitry or clipping diodes to achieve this, it uses a high-voltage xenon-filled discharge tube. The input signal is boosted to a maximum of 3500 Volts using a transformer (if that sounds scary, don't worry, the current is very low!) and then applied to the discharge tube. A pickup antenna collects the electrical energy radiated by the tube when it fires, and this is converted into audio to be fed to the output. The tube is visible through a window in the top of the pedal and you can see various waves pulsing through it as you play. A standard 9V power adaptor is needed to run the pedal, though none is included in the price. I used a standard Boss power adaptor for my tests. A Blend control mixes in the dry sound, and there's a small switch on the rear of the unit that determines whether the dry sound is affected by the on-board EQ or not. Separate low and high controls provide plenty of EQ range, while Voltage acts as a sort of sensitivity control. Volume behaves reassuringly normally. If the voltage is too low to get the tube to fire, no processed sound is output. In practical terms that's a bit like having a built-in gate, but in reality it sounds more like those early fuzz boxes that use biased-off transistors and only spring to life when hit with a strong signal. Adjusting the voltage control is key to getting the correct touch response from the pedal, as when this is set too low some notes won't trigger the effect at all, whereas when set too high the tube will fire any time you brush the strings. You can exploit this gating effect when mixing in the dry sound — by adjusting your playing dynamics, you can have fuzz on some notes and not on others. If you allow notes to decay naturally, they tend to splutter into extinction, again in the manner of a biased-off fuzz, but you soon get the hang of playing to make use of the effect rather than fighting it, and because of the gate-like characteristic, you don't have to worry about loud hums and buzzes when you're not playing. Harmonically the sound is quite complex, as it combines tonal elements of fuzz and bit-crushing, with just a hint of octave fuzz creeping in, and though changing pickups has little effect on the end result, backing off your guitar's tone control helps to tame the harmonic content of the sound. The Plasma pedal responds well to both power chords and staccato lead playing, and could be a good fit for Scandi death metal — but at the same time I can guarantee that blues purists will hate it!